This fish.. oh my word. It is quick, easy, and healthy. Just like my weekend. Quick. The amount of time it takes to make this dinner is approximately equal to the time it took me to fall asleep on the couch after two Fat Tires and a rerun of The Taste on Saturday night. Wild ‘n crazy. Easy. The ability to tell that Amanda Seyfried was wasted at the SAGs last night. She said she hoped they didn’t win for Les Mis because there were “soooo many stairs up to the stage.” Should have been a one hit wonder as Karen Smith in Mean Girls. Healthy. Bikram yoga on Saturday afternoon, where one woman was wearing royal blue shiny spandex with a one-piece bathing suit over them. I couldn’t look away. And I taught Pump yesterday and had a full class, which was good because I was feeling a little self-conscious after making a Justin Tucker joke and having it fall flat. Your arms should look like a goal post for bench press, Justin Tucker could kick a ball through your arms- you get it. Whatever. I guess real Ravens fans probably weren’t taking my class the morning after Baltimore beat the Broncos. I have been wanting to make salmon foreeeever. I found a dish with Asian-inspired flavors on Food Network, but then Harris Teeter didn’t have unseasoned rice vinegar and the sesame oil was one million dollars. So I had to change my plan. And it’s a good thing I did. Heat a couple tablespoons of olive oil in a skillet. Sprinkle both sides of the fish with salt and pepper. I used filets with the skin on, because it helps hold them together when you’re pan searing. Once cooked, it’s very easy to take off. Lightly dust each filet with flour, then place skin side down in the pan. Drizzle honey over the top of the fish, and sear for 3 minutes or so on each side, depending on the thickness of your fish. Place the butter in a small pan over low-medium heat. Allow it to melt and bubble, swirling the pan occasionally. Once it turns brown and smells nutty, remove it from the heat and place in a small bowl. Add the garlic (it will bubble and hiss at you, it’s cool), juice of 1/2 a lime depending on juiciness, and salt and pepper to taste. 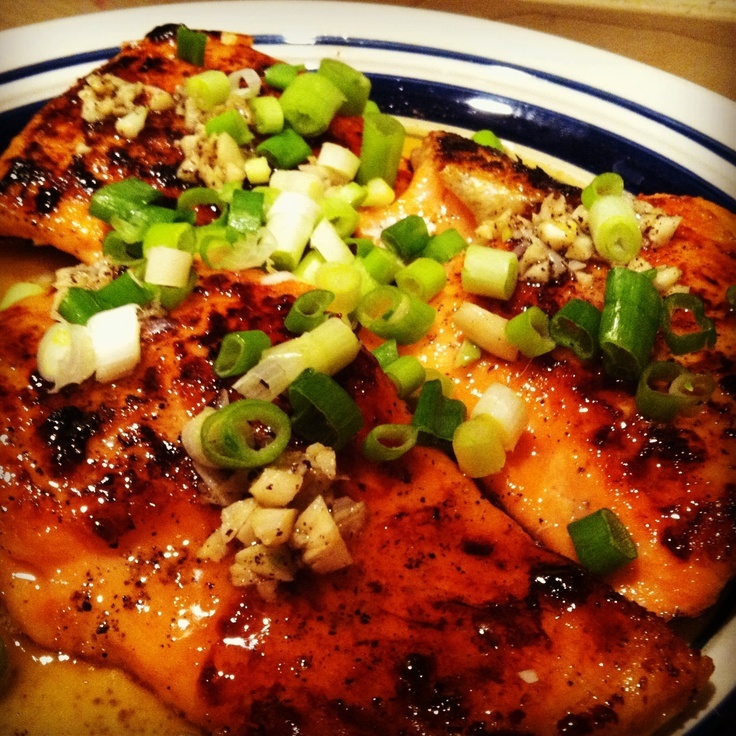 Pour the brown butter over the salmon, then garnish with scallions and lime wedges. Get at me, Omega 3 fatty acids.